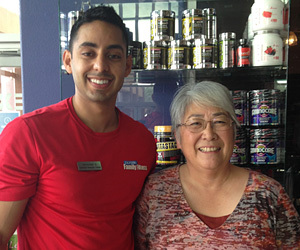 Cal Fit Success Story: Natomas Member, Marilyn P.
When I began working with Certified Personal Trainer, Harminder Sandhu, all I really wanted to do was to improve my balance. I know that balance becomes an issue as we age, and I saw falling and broken bones in my future. When I couldn't even put my feet heel to toe, I was not encouraged. When Harminder said I'd soon be on a Bosu ball, I thought he was delusional. Here I am four months later, not only balancing on the Bosu, but doing squats while catching that unwieldy ball. Incredible! The most important thing that has happened to me is that I’ve gotten the mindset that going to the gym is not only good for me, but (almost) enjoyable. It isn't a chore and it isn't something I dread. My husband is stunned by this turn of events and often says that he never thought he'd ever hear me say, "I'm going to work out." I know my body is changing, my energy level is much higher, and I am really, really happy to be feeling so good about myself. Thank you, Harminder for all your hard work, patience, kindness and for making such a tremendously positive difference in my life.